The third module of this course focuses on assessment practices that reflect the realities of today’s C21 teaching and learning needs. There was less for me to discover in this section, as I’ve already fortunately been on this road for some time. In my second year of teaching, the Fixes came out and I’ve been using them since. What I’ve enjoyed about it is that it takes a lot of the causes of conflict between student – teacher – parent away, since the mark depends entirely on the student. It was still nice, though, to have some reflection time to confirm and revisit my thoughts related to assessment. What’s the meaning or difference involved with C21 assessment? As the focus of learning has moved from lower to higher level tasks and more skill building, there have also been changes in our assessment focuses. In particular, the most significant would be the direction of instruction going from teaching > assessing to teaching, checking comprehension, reteaching, checking comprehension, testing, moving on. I’ve made another t-chart for this comparison; I find this helps me clarify or synthesize my reflections, but there embarrassing part of this is that I don’t remember far enough back to the specifics of my own education experience related to assessment. Did they use formative assessment? Did I ever co-construct criteria? I can’t think back to those specifics. What are your personal practices with assessment in the C21? It’s an interesting time to be taking this course, since I’ve returned to teaching only in the classroom, instead of focusing so much on the online course development and teaching. Having the ability to focus so specifically on this area of my teaching has allowed me to really dig into my practices and try several new things. I really like the memes or infographics that remind people that technology is not the objective – it can enhance learning and assessment – but it shouldn’t be the sole focus. So in the same regards, I include some methods of assessment that are not techy, while others are and they all provide different functions for different purposes. Using the paint swatches to help students develop self-reflection skills (metacognition strength to identify when they’re struggling more accurately and then move on to a strategy to deal with it). When I may be starting a new section or assignment, I’ll have them indicate on the paint swatch how they feel / understand the activity when they begin and if the levels are mostly low then I’ll be aware to add more instruction or pinpoint parts to review with them. They’re also using it to self-assess the benefit of doing formative quiz practice before exams, so I’m finding these paint swatches pretty useful as assessment tools. Assignments can always be improved on: this is one of those Fixes and is required by the division. I always encourage this and point out a summary or itemized list, sometimes, of the steps they could go through to review and improve work. I reinforce that this is part of the learning cycle and that learning can still happen even though we’re done working on it in class. Exemplars: If I don’t have student examples of tasks, I’ll develop them myself. I also like having examples that show the range of abilities. For example, I find it beneficial to show an example at a level 2, 3 and 4 and let students identify what holds one back from being at a higher level. Allowing peer and self assessments: I need to improve this. I do have students do several collaborative tasks, but haven’t involved them much in these assessments. I wouldn’t do this for summative work, but the formative would definitely allow for more self assessment. Holistic reviews: In ELA, I’ve focused more on holistic marking for the Comprehend and Respond and Compose and Create sections of their course. Rather than what’s right and wrong, the holistic method encourages higher level thinking, developing insightful responses, supporting answers with evidence, connecting ideas to self and others. Sequencing learning tasks from small to larger projects. I start small and give formative assessment of small parts of assignments before they’re given as a larger project, like an essay. This falls in line with the idea of assessing for learning, to see if they need more instruction. Chunking stages of a project and giving assessment marks for this process. I need to improve this, but I do break projects up into chunks. To reinforce the value of the process, though, I need to give marks for it. I’ve included a lot more review and metacognitive tasks in the last number of years. I include instruction for a variety of editing methods for post-work. An example is the Colour Coding of an essay, where students have to identify in green the standard they set, blue the judgments they give, and red the integrated text references. These types of review tasks help students identify these steps for future projects. Allow parts of the learning to be risk-taking moments with no fear of affecting marks: I definitely do allow for times when the work doesn’t count, but it develops and reinforces the skill or practice. Socrative is a great tool and I use it quite often. The kids respond well to it and I also appreciate the ability to require them to identify themselves or set the tasks to be anonymous. Using Google Doc: We’ve used it for group collaborations, to identify self-talk as they’ve read challenging texts, to submit practice work for formative review and others. Audio files: these can either be the class discussions of review questions in Psych or a recording of a discussion we had in ELA class that can be reviewed for those who didn’t catch on the first time. Live results: The faster the formative feedback comes and more often allows for greater accuracy with students to know if they do truly understand their content. There are a number of sites and apps I can use for this, but it’s definitely more easily done with the technology. How do your assessment practices compare with the division’s goals for assessment? I had only been teaching for a year when the “Fixes” came out and were implemented in my previous division. It was less formally introduced and a principal was the one who explained to me the benefits to me as the teacher if I took them up: no zeros, no lates, no marks for absences, redoing assignments and no additional work to build up a mark. All these changes reduced the tension between a student / parent and myself since it 100% left the learning and marks in the hands of the student. In this division, it’s been implemented in a more formal way and all schools should be upholding the same practices. I’m not sure that’s the case because when I had online students it seemed a new practice to them to understand they could improve a mark by improving the work, not by doing extra work or that it was even an option. 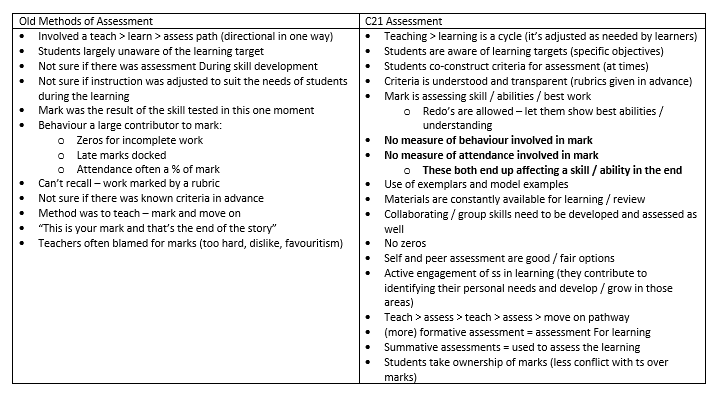 In my own school, there are parts of this that some students still aren’t using to their advantage, like understanding handing in an assignment for marking could be considered only part of the learning process for that work; use the feedback and resubmit to regain a few of the lost marks. Not as many use this option as I’d like, so it’s something I’m reinforcing. Ultimately, I was fortunate not to have to make big changes to stay in line with my division’s practices related to the Fixes. There are still kinks to figure out – what to do with cheaters, repeat offender cheaters, the students who will take 2 months to finish an old assignment etc. Still looking for new ways of dealing with these old problems. What are some strategies to use to allow students to take the lead in their learning? Students have greater access to the learning material. If it’s covered in class and discussion and they need more examples of practice I can make them available to them online. I’m using Socrative and the Paint Swatches to practice formative self-assessment so they can recognize early when they’re struggling to make up for it and not wait too long. They are taking more accountability for their organization methods and timelines. They’re starting to use Keep as an organizer of dated assignments and they’re using Remind to ask questions and confirm things with me. I’ve reinforced with them that even though they’ve gotten an assignment back that they are still in control of the mark. With the feedback, they could make improvements and resubmit for more marks. It’s only done once they’re satisfied with it. I’ve worked with them in my Psych class discussions on “Attitudes” to help identify how significant an impact their mindset and approach to their learning and assignments can be. Some are very hardened to the idea that they can learn while others are well-developed in that mindset. I believe in the impact developed Grit and Resiliency can have on our students, but I recognize it will take a great deal of time and reinforcements for them to move in this direction. It’ll also be a work in progress for me, as well, as even the comments and feedback given by a teacher can focus on fixed rather than a desired growth mindset.